Thermoformed medical trays for sterile and non-sterile medical devices offer product production and maintain product safety and cleanliness. Produced in Dordan's fully-enclosed and complete hardwall construction ISO Class 8 Cleanroom, thermoformed medical trays are the premier packaging solution for medical device manufacturers, contract manufacturers, and designers. Heat-sealed to Tyvek or other substrate lidding prior to sterilization, thermoformed medical device trays maintain product sterility to the point of practitioner use. With intuitive design features, thermoformed medical trays are easy to open and facilitate efficient device removal, catering to the procedural needs of the practitioner. 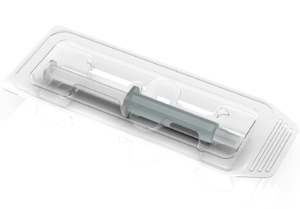 Medical device are kept secure in thermoformed trays with product snap-fit via undercuts, reducing the likelihood of device damage during distribution. FDA-certified, medical-grade materials for plastic medical device trays comply with all FDA regulations and requirements for materials that interact with products intended for patient contact. Paired with the appropriate lidding, sealing, and sterility processes, thermoformed medical trays are the most popular packaging solution for FDA Class I, II, and III devices. Dordan is an engineering-centric, medical device tray designer and manufacturer, offering full-service medical tray design, tooling, and cleanroom thermoforming in-house. ISO 9001:2015 certified and ISO 13485 pursuant, Dordan provides process validation procedures to verify that the thermoforming process produces medical device trays that meet the established specifications re: fiber hairs, particulate, seal-flange, material distribution. Routine QC inspections monitor, measure, chart, and analyze the medical thermoforming process, defining the CPK for customer reporting. Dordan's 2019 Cleanroom is equipped with 2019 Kiefel Speedformers with best-in-class automated forming, cutting, and stripping stations.